As used by Trevor Jackson from the IBBCS, were he clips the whole bodies of their pedigree cattle before showing and then our Showman trimmer for heads. A great clipper for clipping backs of cattle before applying pour on as well as tails and of course, dagging and shearing sheep. 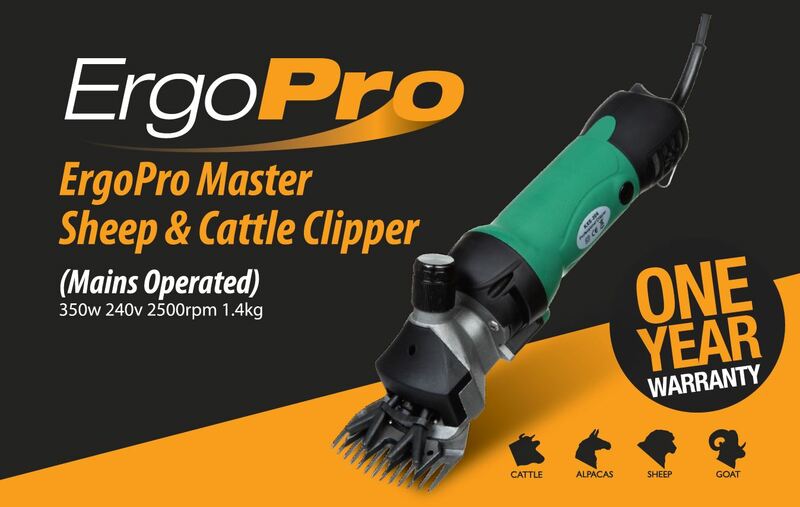 Perfect clippers for the busy professional as they are built for continuous clipping, Farm Relief managed 350 cows tails in one weekend with this clipper! Very good product, nice machine to use no vibration when using. Sheared some rams for showing and it done a good gig on them. My first clippers ,so i knew nothing about different makes and models .Bought this on the recommendation of other people that purchased one .first off, the delivery service is amazing .the clippers arrived in about 18 hours .good sturdy carry case for keeping it protected .the clipper is very well balanced when in use and after a few minutes you hardly know you are holding it .I did 25 cattle the first day and it flew through them ,even though they were in the shed for a month or more so not too clean .never blunted the blade a bit .made a great job of them .Not a noisy machine ,the cable is more than adequate .overall i am delighted with it and would recommend it to anyone who wants a good machine at a fair price . After long consideration about buying a clippers ,mainly because they are expensive to buy .I opted for this model ,because it was a reasonable price compared to some brands .Ordered tuesday afternoon and had it at 10 am next morning .Its a very well made model with good blades ,tried it out on 2 cattle that were on slats for a few weeks ,so they were not too clean .It clipped their backs with ease .will be doing the rest soon . If the cattle are clean it will fly through them .Good long cable , it might seem heavy when you take it out of the box but when in use that works in its favor ,as little or no vibration through the handle .More than happy with it .no hesitation in recommending it to someone who wants a clippers at a fair price .